If you are looking for a flooring option that will provide a stunning and unique look to your home, then acacia wood flooring may be just for you. It looks unique and only fits into the designs of certain rooms and homes. However, many people are basing their home renovation decisions around installing acacia wood because it has a spectacular look unlike any other species of wood. Here is a complete guide to acacia wood flooring. Acacia wood is found in many varieties of trees in Asia, Australia, and Africa. It features wide grain patterns and unique knots. Mold does not thrive on acacia and it is even fire resistant due to the high density. It has been used for flooring for many years, but it also used in making furniture and instruments. Acacia seeds are even used for flour and edible gum. Just like any other hardwood flooring, Acacia has a variety of plank widths, textures, and structures. First, you must decide between the structure of Solid or Engineered. Engineered wood has a surface layer in Acacia with a core made from other species whereas Solid Acacia is the same wood all the way through. Width and textures such as hand-scraped also add character to a home which is also important when you make your decision. With all of these options at your disposal, it's no wonder Acacia has gained so much traction in the flooring world. As with any hardwood flooring option, acacia does have its pros and cons. The biggest advantage to Acacia hardwood is the variety of color. This wood species is able to be produced using a variety of staining techniques or left in its natural state. The increased color variation also helps hide wear and tear and improve its longevity. The high density makes this wood impact resilient which means you can enjoy your acacia floor for many years before it needs replacement or refinishing. Regular sweeping to keep debris from scratching will keep it looking great for longer. Acacia flooring is priced in the mid-range, making it relatively cost-effective when compared to other exotic woods with similar properties. The resistance to mold and bacteria makes it a healthy option for your family's wellbeing. Acacia plants gain much of their character and variation from being shorter shrub trees with an even mixture of heart and sapwood. Naturally, the planks are shorter ranging from 1-4 feet after the wood has been properly dried. If you have a large open room such as a common area or commercial application, this could make your floor appear too busy. If you prefer a cleaner and more modern look to your flooring, then acacia may not be for you. Acacia naturally gives a more rustic feel. There are simply no long length, even colored runs of acacia flooring. This often means the decor of the rest of the room will need to fit around this wood making it the focal point of your space. Due to this being an exotic wood moisture control and proper acclimation is important before, during, and after install. Acacia, like any exotic, is also known to shrink when installing in extremely dry homes. Aim to maintain 35-55% relative humidity throughout the year. 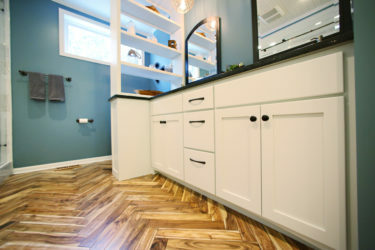 As a homeowner who is selecting the floor, you will have to decide how much you factor each pro and con. Take your time to make an informed decision. If you can make it work, then acacia wood flooring could be an amazing addition to your home. Unique Wood Floors has been a leading supplier of solid and engineered Acacia hardwood for well over a decade. If you have any questions regarding your next project, give us a call today.